Since the release of PGE’s report on their two-year study of algae and aquatic insects, we’ve received a lot of inquiries from our supporters. So let us update everyone on where things are at related to our response to the report. We’ve been able to get four Ph.D. experts in fields related to the ecology of rivers to agree to review the R2 report. It will take us until early June to get the evaluations back from these individuals. We think it will be worth the wait. Please stay tuned. We’ll also be writing up some of our own assessments of the study. We have some resident experts of our own on the DRA’s Board of Directors. You’ll be seeing some of their thoughts within the next couple of weeks. In the meantime, we’re headed into late April. That means the stonefly hatch should be starting anytime. Please send us your reports on the stonefly hatch to info@deschutesriveralliance.org. Although our trained hatch observers will be on the river sending in reports, we’d like to hear from all of you. “Not numerically abundant” is more consistent with our observations based on kick-screening and observational adult insect hatch data over the past few years. So help us out. Given recent temperatures, the stonefly hatch should begin in a few days to a few weeks. As Hafele and Hughes said in The Complete Book of Western Hatches, “It is a show that should not be missed.” Although it seems to be a less dramatic show in the past few years. We would like to hear about your experiences during the hatch. Tell us when and where you see the big bugs, what sorts of numbers you see, and how the fish are responding. 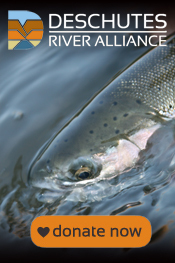 Let us know by writing to us at info@deschutesriveralliance.org. We’ll not disclose any secret fishing locations, nor divulge any other information until after the hatch is over.